Woo Hoo! We had quite a group of women come to visit us in Enfield, CT: Anna, Aubree, Caitlyn, Holly, Jennifer (not pictured), Lauren and Shannon came from all over the U.S. to spend a few days in our central convent. We enjoyed prayers together, pizza, music, dance, exercise, and vocation stories. The women were able to ask questions about religious life, see what it was like, and take part in it, too! 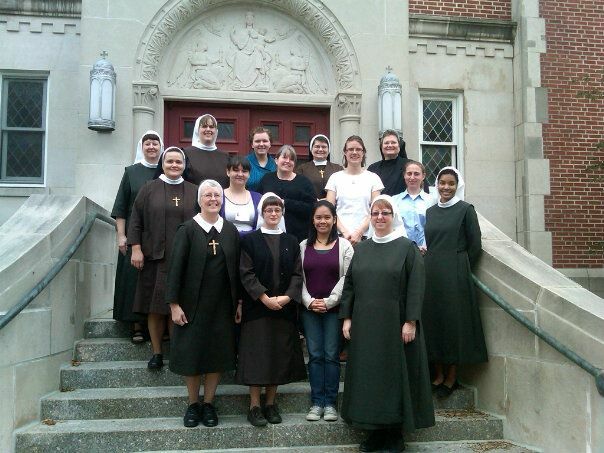 We will be sure to keep them in our prayers as they discern to which vocation in life God may be calling them. There are three choices, afterall; have you ever thought about where it is that you will love God and neighbor best? Maybe as a spouse and parent, or a single person living in chastity; what about as a religious? Sometimes it's where we least expect it, but never be afraid to take that leap. When I jumped, I never actually fell; instead, I keep going up and up and up... Each day I find I am being pulled closer and closer to God, but this wouldn't be the case if I hadn't jumped. Just take some time to think about it, pray about it; it couldn't hurt. If anyone has a vocation story, question, or comment, feel free to leave it below by simply clicking on "comment" and typing in your thoughts!